A website is a collection of the pages that may contain text, images audio, video etc. Which is designed for completing and performing any type of particular task. It is running over the network or server and transforming the data from one destination to another pace. The static type of website is a basic type of website and easy to design. You don’t have to knowledge of programming and database scripting languages for it. You can design a static website simply in HTML. 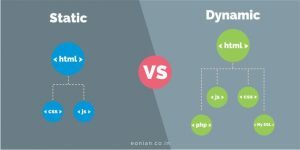 And dynamic website us a collection of the dynamic web pages whose change dynamically over the network. It content database or content management system (CMS). You can design client-side scripting languages and server-side scripting languages both as per requirement.